Thanks to one enterprising soul, we now know exactly how much the security improvements to Shaun and Lisa Wright’s house in Rawmarsh cost us, the simply outrageous sum of £14,783.32!!! 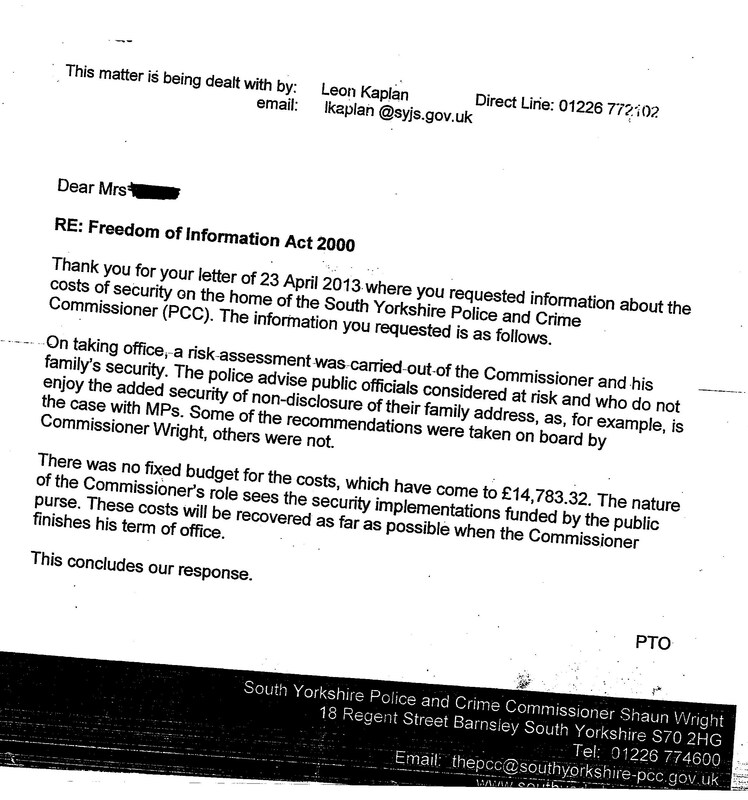 SECURITY at the home of Police Commissioner Shaun Wright has cost the public almost £15,000 – rather than the initial sum of £6,500 which was reported. The rising bill for measures to protect his family — including fencing and CCTV — has more than doubled since February. This entry was posted in Abuse of power, Greedy Piggies, Shaun Wright and tagged Greedy Piggies, Harry Harpham, Jahangir Akhtar, Labour, Labour Chicanery, Labour Party, Lisa Wright, Rawmarsh By-Election 2013, Rawmarsh Ward, Shaun the Greedy Sheep, Shaun Wright, SY Police & Crime Commissioner, Tracey Cheetham by Rik. Bookmark the permalink. Are you in danger of not being able to see the wood for the trees, it must be those red tinted spectacles of yours? I’ve never heard such unadulterated crap in all my life Graham. Why should that political thief Write need any more security than the average member of the public? He is no more at risk than every police officer in the Country and at £84,000 a year, surely this self -serving piece of political garbage should have to pay for any security himself. This man is unbelievable! Muppets who can’t read, write or spell. How can we expect them to understand basic maths never mind the contents of the letter! The point, Graham, is not just a pop at Sean Wright but at the increasing costs of this farcical and unnecessary post. What do we pay Chief Constables for? I am interested to know how the costs “will be recovered” after SW has finished his term!!? Will the fencing be torn down and flogged for scrap or something? CCTV cameras put on e-bay? or maybe set them up outside Rik VHs house and save a few bob that way? No way will the whole value be recovered, leaving aside the cost of recovering it anyway. Of course, by then we may have a new PCC who will want security in his/her turn, so the costs will keep on mounting. This last sentence is obviously a sop to put off people who are rightly outraged by this waste of OUR money. Frankly it’s a load of disingenuous (not to say barely literate) c**p. I had to read it three times to understand it but I suppose we must be thankful we got the info at all…. Do you not realise that this post has replaced a lot more expensive option in Police Authorities and there’s a lot more accountability with one person, who is elected by the people making the decisions, as opposed to 10-15 hand picked picked people who become puppets to the police and don’t make any decisions, with the publics interests in mind. How do some of you people survive in life. Wake up, stop moaning and groaning and if you think you could do a better job, run for the position when it’s up for election next time round! …elected by about 1/8th of people because we were not given any info about candidates. And why, in any case, would I want to stand for a post that I don’t even believe should exist? The social contract implied in paying taxes is that we pay for others to do jobs we haven’t got time to do, because we are getting on with our lives – as long as there is proper accountability. I survive by having the self respect to hold those accountable, whom I am paying for via my own taxation. Dear sheffred, at least when you have a committee of 10-15 people there is some semblance of democracy. The fact is, we now have no democracy whatsoever, we have a lying, cheating left wing dictator who costs us far more than the original Police Authority. Don’t forget, this man is an expert at misleading the taxpaying public with his cover-up of the disgusting crimes in the past. Can he be trusted? I think not. Even if Mr Wright was elected by an eighth of the electorate, that was a hundred per cent mandate of those who could be bothered to vote. The bodies you outline as happy to monitor the Police are not exactly covered in glory themselves, particularly the NAO. They are also not directly accountable to the public, not even one eighth. The introduction of more democracy seems to be a blind spot for lots of people, including you. The problem is not with the post, it is the fact that the wrong man ( in this case) got the job. I am convinced that if almost any of the other candidates had got the post there would have been a lot more heat under the police and the social services collars concerning almost every aspect of the maintenance of the Queen’s peace and the upholding of the law. Your argument implies it would be better to return to feudal rule as parliamentary democracy has a few bad eggs. The irony is that if PCCs didn’t have their own (and their mates’) noses so tightly in the trough they would need a lot less protection from an outraged public!! As you can tell I am mad about this – when was the last time you had a “dinner” valued at nearly £15k? It would need a pretty big bin for the leftovers! If the costs declared to public were £6500 but the true costs were £14783 I hardly think Rotherham Politics can be accused of looking a one side of the coin! That is as much as most of the people he claims to represent, or who voted for him earn. Grow up and remember your position in the community. If you do half the job of what SW did in Rawmarsh, I’d be very surprised. Why don’t you go and speak with his neighbours, in fact, why don’t you go and speak with the man himself and see why this security was recommended by the SYP risk assessment, that was carried out? How stupid would he have looked if he had gone against the risk assessment recommendations and something serious had happened to any member of his family? Are you saying that you would go against something that is recommended to you, that would put your family at risk?? This comment from a card carrying member of the Labour Party! Please refrain from this type of abuse! Rotherham Politics is not that kind of blog. I think you should start to take up residence on this planet sheffred instead of living in cloud cuckoo land. The only reason this piece of political filth succeeded in becoming PCC is that there were unlimited funds available to him through the Labour Party which no doubt people like you pay for. 1 – I have no affiliation with any political party, never have and never will, when i vote i spoil my paper. 2 – Did the Tories not run in the same election and have the same if not more funds available. Yes I do know my place and responsibilities in the Community and one of them is to see that there hard earned money is not wasted in my opinion and many more this is. And yes, I would protect my family if they was in any danger, and at £85.000 a year I could and he could afford to pay the cost himself, approx £3500 out of his £85,000 I don’t think he would miss this do you? He didn’t need protecting when he was on the Police Authority so what’s the difference now? None at all! So why try and deceive the Tax payer by saying it only cost £6500, if not trying to cover the true cost up! Same Guy who two years ago said “I know how important Boston Castle is to the people of Rotherham” after approving £650k of Ratepayer’s money to renovate it (+ a further £20k per year for upkeep) I bet a high percentage of “the people of Rotherham” don’t even know where this Vandal Magnet is?